Congratulations, you're going to have a baby! What's next? Choosing a name for your baby can be a difficult and confusing task. 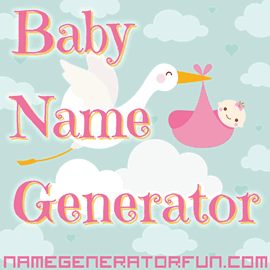 If you're tired of wading through books and name databases and you want to take a different approach, we hope we can help you out with our baby name generator! Simply select your choices from the form below and click the button to generate your name and meaning! Our baby name generator draws on a very big database of first names. Our categories currently include names that are popular with parents today, old fashioned or vintage names, romantic Celtic names, mythological names, and biblical names. The idea behind our name generator is to allow you as a parent to choose names by seeing your baby's first name next to his or her surname, as you would in real life. Instead of having to wade through big, slow baby name websites for possible names, you can choose to see a list of random names, or get a random name and its meaning one by one, to test whether it feels right for your baby. Choosing a name for a baby is an important and intimidating task, and it's a choice that will potentially shape your child's future in a massive number of hard-to-predict ways. As a result, there are certain things that it's worth bearing in mind when looking at possibilities for baby names. Make a list of potential names, and then just say them out loud, along with your surname. Almost immediately, you'll be able to cross a whole bunch of possibilities off your list. Especially if you've got other children, compare the names, and beware of making them too similar – Huey, Dewey and Louie might be adorable cartoon characters, but kids with those names would face a mind-boggling level of ridicule throughout their lives. Does Your Partner Love the Name as Well? If you're raising a child together, it's important to be on the same page, especially so you don't end up creating resentment further down the line. Each make lists, see which names appear on both – and maybe be prepared to compromise and give up on a treasured favourite if it means you can both agree on how to move forward with the name. Does It Go with Your Surname? The last thing you want is to accidentally create a pun or comedy name – such as 'Warren Peace' – so check each possibility with your surname and see how they sound. Anything like 'Harry Barry' or 'Shelly Dellie' should be avoided, as they're way too open to mockery – while also make sure that the name fits with your surname without fitting too closely, ending up with something like 'Dave Davies' or 'Robert Roberts'. How much do you want your child to blend in with the crowd? Names like Harry, Jack or George are still extremely popular, but they're also very common – your child could end up with multiple schoolmates with the same name. Also, be careful of going for the name of a well-known celebrity, unless you want your child (and yourself) to be constantly asked whether they're named after the person in question. Don't go for a name that might remind you of something difficult from your past, whether it's an ex or a school bully, and also think about all the potential things your child might get teased over, especially what combinations or shortened versions of the name might sound like (Hint: if your surname is 'Hunt', you'll be helping your son out a lot if you don't call him 'Michael' or 'Mike'). Especially if you're going for a more unusual name, make extra sure that the original meaning of the word isn't something that will come back to haunt your child – like 'Candida' (which is a fungus that can sometimes cause thrush) or 'Melanomia' (a type of skin cancer). Your child isn't going to be an adorable bundle of joy forever. Giving him or her a cute name like 'Boo', 'Zizi' or 'Kitty' might not be ideal for them in twenty five years time when they're applying for jobs or trying to build a career as the toughest litigator in town. Going for an unusual name can make a child distinctive – but you don't necessarily want to ensure that your child is going to have to be correcting spelling or pronunciation for the rest of their life. Check with other family members or friends, see how easily they can pronounce or spell the name, and if the result is confusion, a rethink may well be in order. Image Credit: Stork designed by Freepik. Licensed under CC BY 3.0.